Since the beginning of time humans have carried their children on their shoulders. It’s ingrained in our DNA. It’s part of what makes us human. Having the gift of walking upright gives us the unique ability to free our hands to hold on to our children’s ankles while they sit on our shoulders on longer journeys; unless, of course, you are a saint, in which case you apparently do not need to hold their ankles and miraculously they’ll be safe. However, since most of us are not Saints we do require for the safety of our children to hold firmly to their ankles, preferably with both hands. It’s convenient for the parent and children absolutely love it. While this is a perfectly safe tried and proven method, it has a huge downside. As most of us are aware, in this busy multitasking world we live in today we need our hands to do more; hold siblings, bags, dog leashes, cell phones, cameras, water bottles; you name it. As a new generation of carrying and vault parents, we create deeper relationships with our children. We want our parent-child bonds to be stronger and more connected. We want these early years and our children’s lives to matter and to be remembered. Saddle Baby is a new patented and uniquely simple product that supports all of these wonderful things in a very compact and powerful package. Saddle Baby replaces the traditional method of needing to hold your child’s ankles, with a much safer and practical system that uses high-quality materials: industrial velcro and adjustable buckles to secure your child. Your children will love it, and daddy too. Saddle Baby allows you for the first time to safely free your hands to do more. Your little one will love it! Saddle Baby consists of an adjustable belt worn high up on your chest with incorporated ankle cuffs to secure your child’s legs. Additionally, the original model includes a detachable and ergonomic foam saddle that provides substantial comfort for you and your baby. To start, adjust the width of the belt with a back webbing to fit your chest size. Put the belt high up on your chest with the ankle cuffs facing up. Attach the saddle to the belt if you’re using it, otherwise sit your child on your shoulder as you normally would. Secure each leg with the ankle cuffs and you are ready to go. You can now use the center buckle to fine tune width if needed. 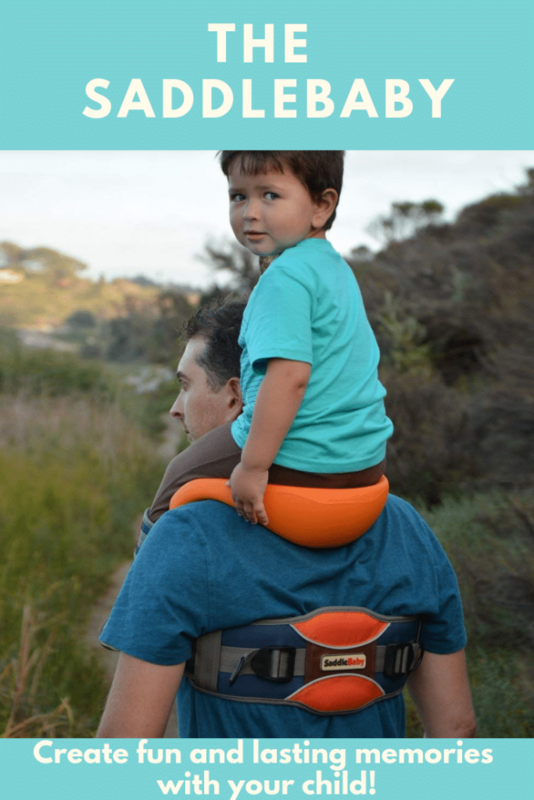 Saddle Baby is the perfect solution for active and involved parents looking for fun and wanting to spend quality time with their children outdoors. Saddle Baby; anytime, anywhere, and everywhere.